Annuities act as an insurance product that pays you income and some investors use them as part of their retirement strategy. There are three different types of annuities, including fixed annuities, variable annuities, and equity-indexed annuities. Each differs in investment strategies, fees, risk tolerance and returns. Along with different types of annuities, there are different annuity riders that are an addition to your annuity that may expand the policy’s benefits or exclude certain conditions from the annuity’s coverage. Therefore, it is important to speak to a financial professional to learn which annuity (and annuity payout option) suits your needs best. This option allows for you to have access to the full amount of money of your annuity payout. The pros of this is that you do not have to wait for a monthly and possibly fixed payout. You are then free to manage the money as you please. The flipside of this is that you now have a large amount of money at once and may spend it too quickly or it may be mismanaged or invested poorly and you run out of money. Another con is that you have to pay income taxes on the entire investment-gain portion of the annuity. The two most common methods to receive your cash payouts are the systematic withdrawal schedule and the annuitization method. The following two options describe how the systematic withdrawal schedule pays out. With this method, you have total control over the timing of your distributions but have no protection against outliving your annuity assets. With this payout option, you choose the amount of payment that you want to receive each month and the payments continue until you stop them or you run out of money. The pro to this option is that you are free to select the amount of money you receive monthly. The con to this option is that you will not have a guaranteed income for life. If you pass away prior to your income payments beginning, your beneficiary may receive a death benefit from the insurance company that sold the annuity. Death benefits commonly include the contract value or the premiums paid. The second most common method is the annuitization method. This method guarantees you monthly income for a defined period of time. 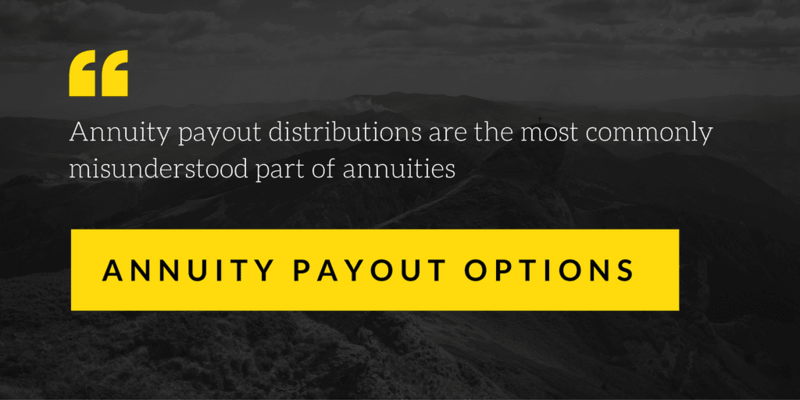 This annuity payout option allows you to choose a defined period to receive your payouts. For example, 10, 15 or 20 years. Payments will continue post-death and will then go to your chosen beneficiary. With this option, the insurance company makes payments for as long as you live. The payment amount is decided by life expectancy. In other words, the longer your life expectancy, the smaller the payment amount. The con to this option is that you are not able to choose your payment amount and there is no guarantee that you will receive the total amount you accumulate. The pro to this option is that you are guaranteed income for life and if you live longer than your life expectancy, you could receive more than the accumulated value of your annuity. This annuity payout option is also known as Guaranteed Term and is similar to Life Only. There is an addition to this annuity payout that you are guaranteed income for a certain period of time. For example, if you choose 10 years but pass away prior to the end of the term you are guaranteed payment of your estate or your beneficiaries will continue to receive payment until the end of those 10 years. This annuity payout takes into account your partner or a survivor. The insurance company will pay you or your survivor for as long as either of your lives. The amount of the monthly payments is typically smaller than the Life Only option because the company now has to pay the longer of two lifetimes. Note that not all annuities provide these types of options and may offer different types of annuity payouts. Depending on whether you invest in a fixed annuity or a variable annuity, for example, can change how you receive your annuity payouts. Again, speaking further with a financial professional is recommended to pick an annuity with annuity rider options and retirement payout options that best suits your needs.